I find this painting very appealing. I first saw it over at Girl With Her Head in a Book. Thanks! Walter Langley is an English artist (1852-1922). He was born in Birmingham and was what the English call working class. Here in this painting we have a peasant girl leaning against a tree reading. She has been carrying water and is wearing clogs. Maybe she snatched a time out from that hard work! 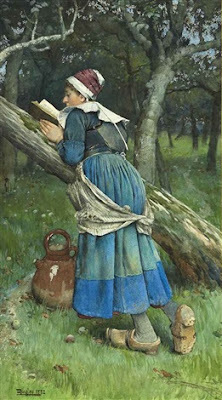 What do you think she was reading?